Hydrovac Edmonton| Equipment | Canessco Services Inc. When you have a problem with your sewer, you need to hire someone with the right equipment to quickly and efficiently clean up the mess. We have several types of pumping and jetting equipment to suit your cleaning needs. At Canessco Services Inc., we are very proud of our well-maintained, state-of-the-art equipment; they are essential tools in getting the job done right, which in turn makes for happy clients. 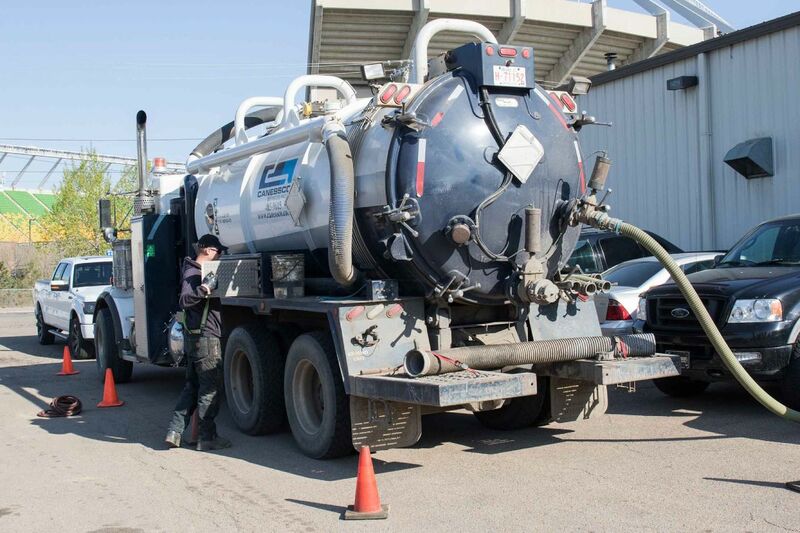 The next time you’re in need of a hydrovac in Edmonton, or a sewer line inspection or cleaning, you may see one or more of the pieces of equipment detailed on this page. To put our team and equipment to work for you, call Canessco Services Inc.
Each of these trucks has the capacity to handle 3000 PSI at 65 GPM. They can also hold up to 1500 gallons of water and have debris tanks that can hold 15 gallons of waste. The on-board boiler of each truck can reach 180 degrees. Each also has 3000 imperial gallons and a 1200 Fruitland vacuum pump. This truck stores 500 imperial gallons and has an 800 Fruitland vacuum pump. This equipment is used to clean lines that are 1” up to 4”. We use this equipment to inspect and locate problem areas in 2.5-6" pipes. When you use this resource, we will also give you DVDs and written reports on the inspected pipes. This camera inspects 6”- 42” pipes. Clients who need pipes inspected can also access pipelogic reporting. If you have a mess, you really want to bring out the best hydrovac Edmonton has to offer, simply call Canessco Services Inc. With our state-of-the-art, highly efficient equipment, we can provide an unparalleled sewer line cleaning experience, all while minimizing any disruption to your property. When you call, we can provide you with an on-site quote so you’ll know exactly what needs to be fixed and how much it will cost to get it done. Best of all, you’ll be working with one of the best-equipped and experienced teams in the city. Contact us to arrange a visit to your location to discuss services.